By W. Gardner Selby on Monday, September 11th, 2017 at 4:11 p.m.
Texas Gov. Greg Abbott, who announced his 2018 bid for re-election in July 2017, has invoked George Soros as a threat to Republican hopes in Texas. Soros has yet to put money into Texas state elections, records suggest. Republican Gov. Greg Abbott of Texas, who has yet to draw a consequential Democratic challenger, has a lock on out-polling George Soros next year. Soros, a Hungarian-American New York benefactor of liberal causes, won’t even be on the ballot. Regardless, Abbott this summer repeatedly singled out Soros, most publicly while kicking off his re-election effort with a speech that mentioned the non-Texan more often than California’s Nancy Pelosi, the Democratic U.S. House minority leader who has long been bandied to rouse conservatives. Abbott’s speech, as prepared for his July 14 kickoff in San Antonio, referred to Soros just after mention of Hillary Clinton, the 2016 Democratic presidential nominee who fared better in 2016 in Texas than Barack Obama performed in the state four years earlier. "Liberals think they’ve found cracks in our armor. "In 2014, I won Harris County and Bexar Country. In 2016, Hillary won them both. "He poured big money into Harris County and they won every county-wide race. "Liberals are messing with Texas. "Every far-left liberal you can think of from George Soros to Nancy Pelosi is trying to undo the Texas brand of liberty and prosperity. "I have news for the liberals. Texas values are not up for grabs." Abbott had earlier warned donors about "liberal billionaire" Soros in a June 23 email blast, saying: "With that type of endless funding from liberal mega-donors, I need every Second Amendment defender in Texas to join the fight. You may remember this response by the brave Texans who stood in defiance of those that tried to disarm them at the Battle of Gonzales, igniting the Texas Revolution: 'COME AND TAKE IT!'?" The same weekend of that blast, Abbott was featured at a Colorado Springs gathering of Koch network supporters and, according to The Hotline, a National Journal political newsletter, brought up Soros’s spending in the 2016 Houston-area race won by Kim Ogg, the Democratic nominee for Harris County district attorney. As he spoke, Abbott’s campaign treasury wasn't bare; it had a comfortable balance of $40.8 million, his campaign later reported. But according to the National Journal’s recording of the panel discussion, Abbott warned of outside funds helping along Democratic creep in his home state (where a Democrat hasn’t won statewide since 1994). "There’s a lot of money going into the state of Texas that you all would not even know about," Abbott said. "I mention two words that should put a shiver down the spine of everyone in this room: George Soros," he said. After a few low boos, Abbott went on to say that Soros gave "half a million dollars" to Ogg--and Clinton carried the county that November as well. "And so," Abbott said, "we’ve got our work cut out for us going forward," adding that his campaign intends to gather "an army" of 10,000 to 15,000 ipad-toting supporters to canvass door to door. "The reason, in part, is that is the model that George Soros used so effectively. We’re going to take that and ensure that Texas will stay bright red for a long time," Abbott said. Through the summer, we failed to draw comment on Soros from Abbott’s campaign or his consultant, Dave Carney. 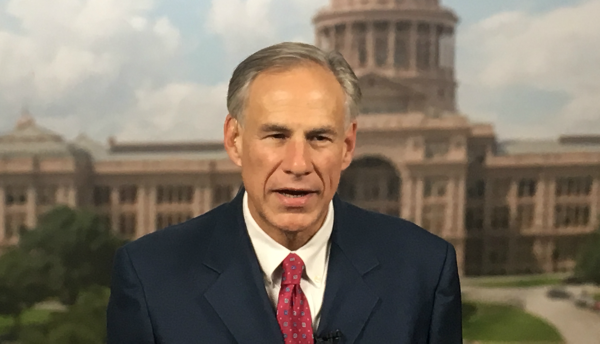 Meantime, Abbott again hammered the Soros’ factor in the race won by Ogg in a July 29 commentary for the Washington Examiner, saying that in 2016, Soros "reportedly spent nearly $11 million on a dozen local district attorney races, including one in Harris County, Texas. The vast majority of his selected candidates won when their opponents were overwhelmed by the inflow of cash and negative campaigning," Abbott wrote. An extensive December news story cited by Abbott, in the Daily Signal, a multimedia project of the conservative Heritage Foundation, quotes Ogg, who unseated the incumbent Republican, saying that she appreciated the Soros-backed aid--pegged by the Daily Signal at about $878,000 from the Soros-funded Texas Safety and Justice PAC--though she’d set her campaign themes before the infusions and, Ogg said twice, she doesn’t personally know Soros. Previously, an October Houston Chronicle news story recapped Soros’s spending on Ogg’s behalf. That story quoted incumbent Devon Anderson's consultant, Allen Blakemore, saying that Ogg "has abandoned the values and standards of our community to become a puppet for those whose clear agenda is to corrupt the rule of law in Harris County." Wayne Dolcefino, representing Ogg’s campaign, volleyed: "We welcome contributions from anyone in the country who wants to make people safer and actually remember what justice is." The Chronicle story said: "Soros, a Hungarian-American immigrant who made billions in currency speculation, has publicly supported a number of criminal justice reforms, including reducing racial disparities in sentencing and relaxing marijuana restrictions. Ogg has pledged if elected to redirect tax dollars away from prosecution of misdemeanor marijuana charges toward prosecution of violent criminals. Soros has also contributed to district attorney races in Florida, Illinois, Mississippi and New Mexico, each through state-specific PACs with variations on the name ‘Safety and Justice.’"
This year, Abbott hasn’t flown solo in warning about Soros, Texas journalist Chris Hooks pointed out in an August story for the liberal Texas Observer. That story says that re-election-hunting Sen. Ted Cruz "tells his supporters that the son of the ‘notorious’ Soros has given a few thousand dollars to his opponent, fearfully offering that ‘the partnership between Beto O’Rourke and the billionaire Soros family won’t be easy to overcome,’ and adding in another email that the Soros family had gone ‘ALL IN’ on ‘knocking off Ted.’"
U.S. Rep. O’Rourke, D-El Paso, declared his candidacy for the Cruz-held seat in March. The same month, O’Rourke’s campaign fielded a $2,700 donation from Jonathan Soros, CEO of JS Capital, LLC, according to an O’Rourke federal campaign finance filing. Jonathan Soros’s father is George Soros. George Soros showed an interest in other races for Congress; in the first half of 2017, he made $2,700 donations to five incumbent Democratic senators, according to our search of Federal Election Commission records. In May, too, Soros contributed $80,000 to American Bridge 21st Century, a self-described "progressive" group that says it's focused on holding Republicans accountable. In June 2012, about a month before Cruz emerged as the 2012 Republican Senate nominee in Texas, Soros gave $1 million to the American Bridge group, we confirmed from the FEC. The Observer story says Republican Lt. Gov. Dan Patrick "feels he’s the bigger target" of Soros, "emphasizing that he’s been made ‘Public Enemy #1’ by the Soros Machine, who is ‘putting a big spotlight on my race for re-election’ and ‘will invest millions in Texas to try to defeat me,’" the story says. Patrick’s political consultant, Blakemore, didn’t reply to our Soros’ inquiries. We also asked the Republican Party of Texas what it considers the most accurate accounting of Soros fueling Democratic bids for state office. Spokesman Jamie Bennett said the party didn’t have information on the topic. If Soros, who also didn’t respond to requests for comment, is gearing up to sway the 2018 Texas elections, records suggest he’ll be doing so for the first time. From 2000 into 2017, according to our search of campaign finance reports filed with the Texas Ethics Commission, Soros didn’t personally donate to candidates for state office--not even once. But Soros indeed poured money into Democrats seeking the Harris County district attorney post in 2016. Our search indicates Soros made 10 donations totaling $1,456,800 to the Texas Safety and Justice PAC, which all told redirected $644,477 to the Texas Democratic Party; $583,684 in support of Ogg; and before that, in Harris County’s Democratic primary for district attorney, $246,854 in support of candidate Morris Overstreet. Otherwise, a Soros daughter-in-law, Jennifer Allan Soros, contributed $1,000 in 2004 to Democrat Mark Strama of Austin in his winning bid for a Texas House seat and she made two 2014 donations totaling $5,000 to Democratic gubernatorial nominee Wendy Davis. In 2010, our search indicates, Andrea Soros, daughter to George, ponied up $1,500 to Democratic gubernatorial nominee Bill White, who otherwise hauled in a $10,000 donation from Jonathan Soros. Add all those Soros-connected donations up and they’re chicken feed compared to the millions spent in a typical Texas governor’s race. We asked Tariq Thowfeek, a TDP spokesman, to speak to how the party spent the Soros-originated money relayed to the party in 2016. Thowfeek had no comment. Democratic consultant Mustafa Tameez of Houston later said by phone he thought most of the Soros donations helped Ogg buy TV ad time. Soros has put his money into backing candidates who share his desire for criminal justice reforms, Tameez said, but he’s not an established force in Texas state elections. "It’s a shame" Abbott "has to mislead his donors to raise a little bit of money," Tameez said. Soros, he said, "has been turned into a boogeyman for the people on the right, as if he is somehow funding efforts to change our government system."